As the exclusive tile supplier for the Gary Sinise Foundation’s R.I.S.E. program (Restoring Independence Supporting Empowerment) in 2017, Crossville recently celebrated the 10th specially-adapted smart home dedication. Throughout the past year, Crossville has donated more than 10,000 square feet of tile for installations in kitchens, bathrooms, laundry rooms, and other spaces inside homes custom-built for wounded veterans and their families. “It’s exciting to know we have contributed to help 10 deserving heroes and their families enjoy the comforts of brand new, specially-adapted smart homes. Our tile is a part of the everyday surroundings that are making life better for those who’ve sacrificed so much,” says Lindsey Waldrep, Crossville’s vice president of marketing. The beauty of tile is far from being the only driving force for incorporating Crossville products into the design of these unique homes. Tile’s performance, versatility, and ease of cleaning are also key factors in its use. “The tile specified for each family has been chosen to make life more simple and solve challenges, all while looking beautiful for the long term,” Waldrep shares. The dedication of U.S. Navy EOD1 Andrew Bottrell’s home in San Diego, Calif., marks Crossville’s 10th R.I.S.E. home completed this year. Crossville tile was installed in the master bath, guest and upstairs bathrooms, and in the laundry room–covering the floors and walls. The master bath and shower floor and walls feature Crossville’s Gotham collection. With subtle striations, aggregate finishes, and lived-in colorations of concrete, this collection provides an urban aura for the space. In addition, Crossville’s Ebb & Flow collection accentuates the master bath walls with a touch of stone and glass. The upstairs bath features Crossville’s Buenos Aires Mood collection. This line offers an elegant color, touchable texture, and sensuous movement to offer the right look and feel for a relaxing space. The Gary Sinise Foundation honors America’s defenders, veterans, first responders, their families and those in need. Through its R.I.S.E. 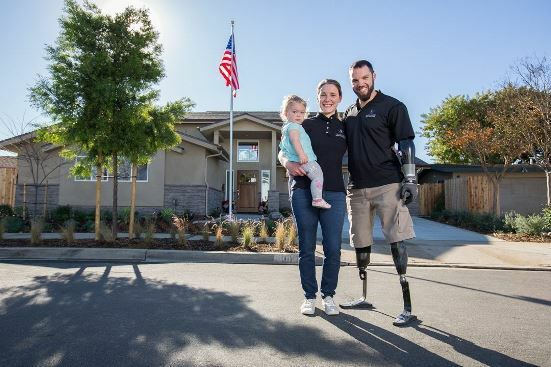 program (Restoring Independence Supporting Empowerment), specially adapted smart homes are being constructed for severely wounded veterans nationwide. Each one-of-a-kind home is customized to ease the everyday burdens of a wounded hero, their family, and caregivers. Other programs include Relief & Resiliency Outreach, Invincible Spirit Festivals, Gary Sinise & the Lt. Dan Band, Arts & Entertainment Outreach, Serving Heroes, and First Responders Outreach. Its latest program, Soaring Valor, is sending WWII veterans to The National WWII Museum and documenting their first-hand accounts of the war. For more information, please visit GarySiniseFoundation.org.